Hello Friends, I hope you have been well since our last Spring on Bleecker Street post (Part 7). It’s so embarrassing to be late for your own party …. 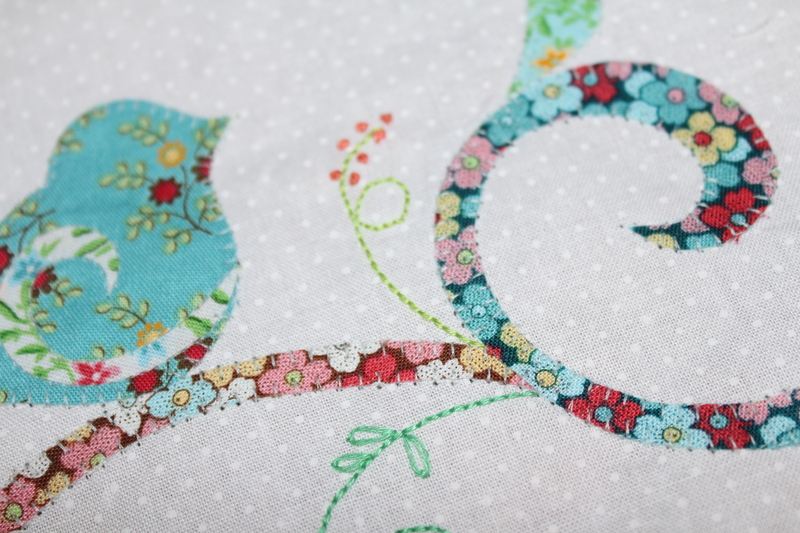 please apologize for the delay in posting the latest installment of our Spring on Bleecker Street Sew-Along! But before I share about the new part added to the quilt, let’s enjoy what you have sent in! And THANK YOU, and good job for keeping up! And please don’t feel bad if you haven’t been able to devote as much time as you would like on the project. I know I sure haven’t because of the happenings in my life recently. This is mine from Part 7. Billie of http://billiebeesblog.blogspot.com (I have “known” Billie for quite a few years. I have affectionately called her the queen of BOM’s because she works out the coolest BOM projects. 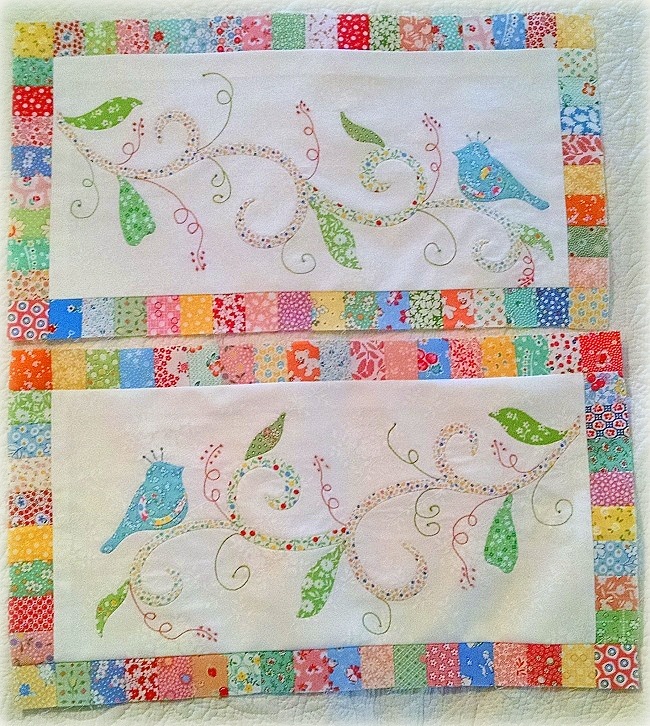 Stop by Billie’s blog and see all the amazing quilts she is making! Gail’s 30’s version is looking really really sweet!!! The next parts for me (embroidery and framing pieces for the swirly bird blocks) looked quick and easy for me, but by far, this has taken me the longest time! So, if you are doing it my pace — be prepared. But then, I am slow at everything. So maybe that’s why it’s took me longer than I expected. You can either add the framing pieces first, or the embroidery first before the framing pieces. I actually embroidered first — because I had a window where I could do Mom duties and handwork at the same time. I probably would have framed the blocks first — because I think that will keep the squares squared up more easily. But doing the embroidery first didn’t seem to the affect the square-ness of my blocks because I have starch-pressed the blocks really well before hand. I have to admit — I am getting up there in age, ha! When I do handwork these days, I use a pair of jeweler’s glasses to help. I like to keep my stitches as consistent in length as possible. The good thing about the glasses (though it makes me look like a total DORK!) is that I am able to see the weave of the fabric to gauge my stitch length. My favorite is to have my stitches cover 2-3 weave lengths of the fabric. If it’s 4-5 weave length, the stitches end up being a little too long for my taste. 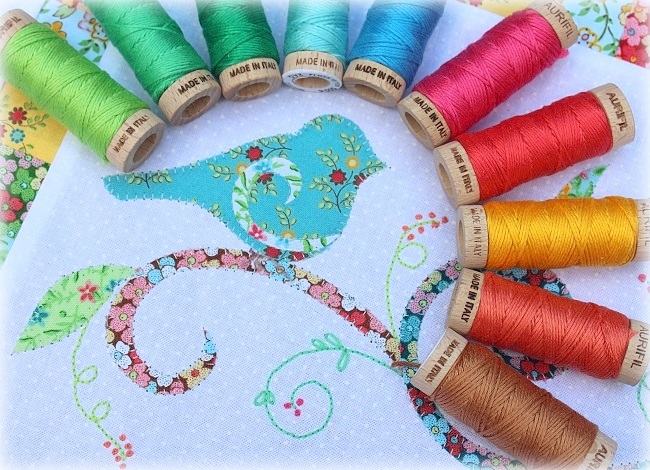 When doing hand embroidery stitching, I always use 2-strands of embroidery floss! 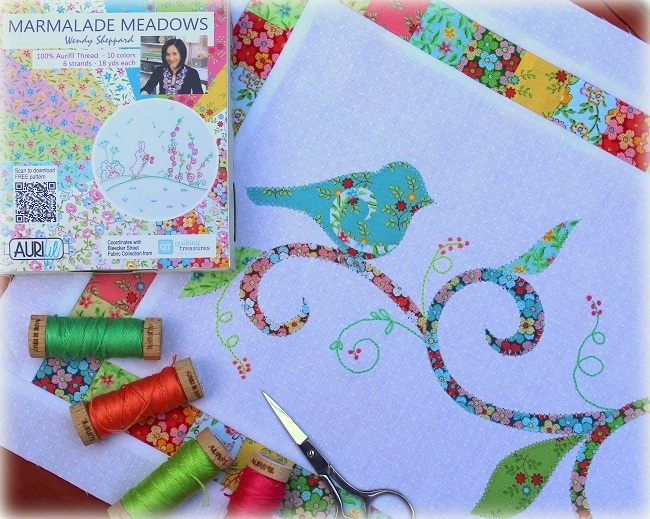 I am using floss from my Marmalade Meadows floss I have curated for Aurifil! I love the Aurifloss because like the rest of Aurifil’s threads, the floss has minimal lint — which makes my stitches really crisp! I am also not needing to condition my floss before stitching. So I pretty much just thread and needle and take off! #1. Cinnamon’s Quilt Shoppe here. #2. You may contact www.followthatthread.com to order. #3. Pumpkinvine Corner (scroll down to the bottom of order page) here. The floss box comes with a free pattern to make this little mini quilt with the stitchery design inspired by Miss Baby’s art work! She really did come up with the original artwork which I adapted for stitchery. You are first to know — Miss Baby and Marmalade (the pot belly bunny) are working up something for Christmas. I hope to be able to get the project completed and share with you by the end of October in case you want to make the project in time for Christmas! 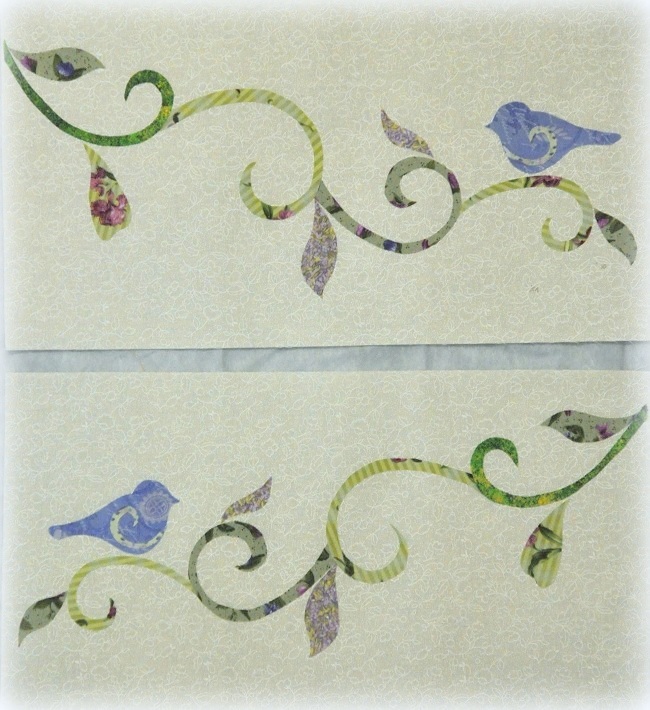 Here are a couple of close-ups of stitchery on the swirly bird blocks. And don’t feel like you have to followed exactly how many French knots to add to the tendrils. I always get carried away when I do French knots, and I ended up adding more than the number of French knots shown in the diagram in the instructions. Now onto the framing pieces: another 2 hours! The piecing is pretty much straightforward! 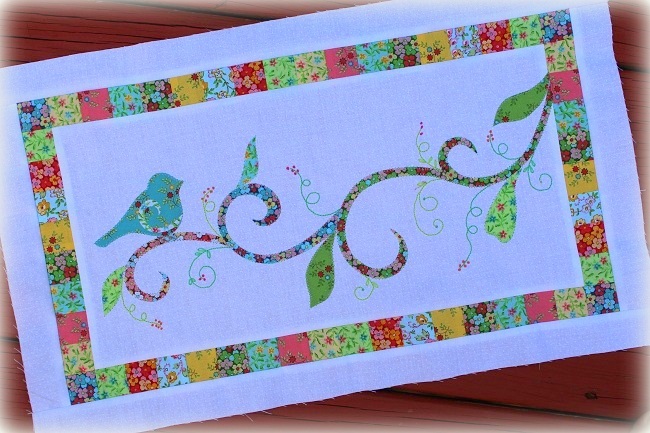 The only thought I will share is that it’s easier to make the pieced 1″ squares by fours! Make units of 4-squares, and then sew them together. That way, the 20-square unit won’t end up wonky! It took some time, but the effect was so worth it. 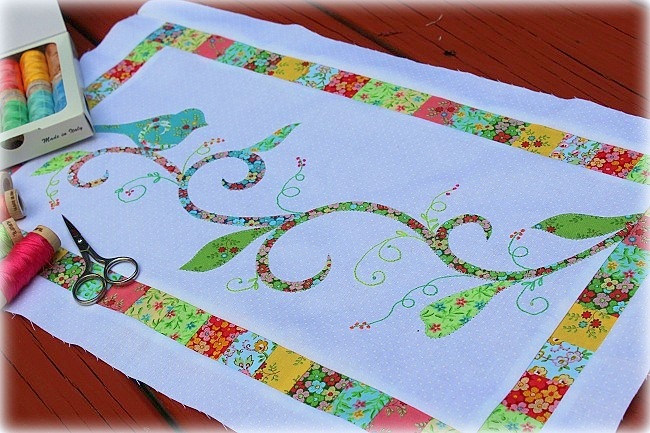 The tiny squares gave the swirly bird blocks a cute jeweled look! And that’s all for this time! Remember to enjoy the journey!!! It’s quite amazing to see the progress I have made the last few months — just for trying to keep up! I couldn’t have done it without being accountable to you! THANK YOU for sewing-along, and thank you for ensuring that I am making progress, albeit be it snail-speed. And you heard it first here — my next sew-along project planned for next year will be snail-ish! 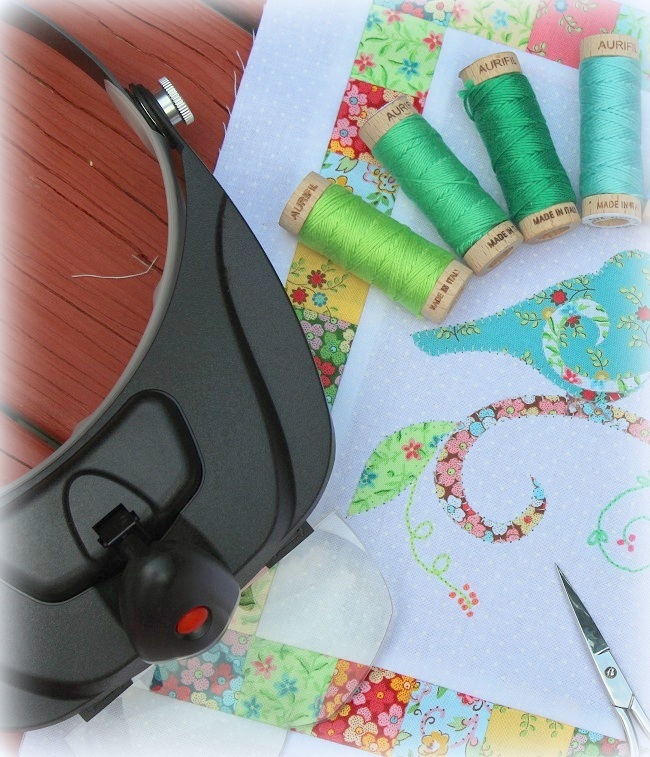 This entry was posted in Quilt Pattern, Quilting, Quilts: Pieced & Applique and tagged Bleecker Street Fabrics, Quilting Treasures, Sew Along, Wendy Sheppard Designs. Bookmark the permalink. Thank you for giving us another month to finish these. I feel very slow as well. Hopefully I can catch up on a lot of my stitching this month.